My earliest memory of football is as fuzzy as the rabbit-eared reception of my grandparents’ television. The Los Angeles Rams lined up for a field goal. The kick was blocked and a mad scramble for the ball ensued. Research tells me that this was the 1976 NFC Championship, and the Minnesota Vikings returned the kick for a touchdown. I was 6 years old. My next football memory is of my dad explaining that those same Vikings were playing the Oakland Raiders in something called the Super Bowl. Succeeding years cemented my lifetime love of sports. I followed everything from pro football to college hockey. I studied sports history as much as my teachers wished I had studied for their classes. Eventually I became that guy spewing lifetime batting averages on cue. Warmly written baseball anthologies were plentiful, but football books focusing beyond the game’s violence proved scarce. Directors produced sentimental baseball films like When It Was a Game and Ken Burns’ Baseball. I read The Glory of Their Times, a fabulous oral history featuring early 20th Century baseball players. I craved a similar book documenting football players. My career path at the threshold of my 40s twisted around playing guitar and a safety net part-time job. On the side, I wrote a few online articles and pasted together a (hopefully) humorous novel entitled, Broke and Famous. Never did I think I’d compile the football book of my dreams. The tournament’s reception, hosted at the Texas Sports Hall of Fame, kickstarted the project. Robert introduced me to Pro Football Hall of Famers Ken Houston and Elvin Bethea, and they both agreed to interview. Dallas Cowboy legend Walt Garrison also said yes. 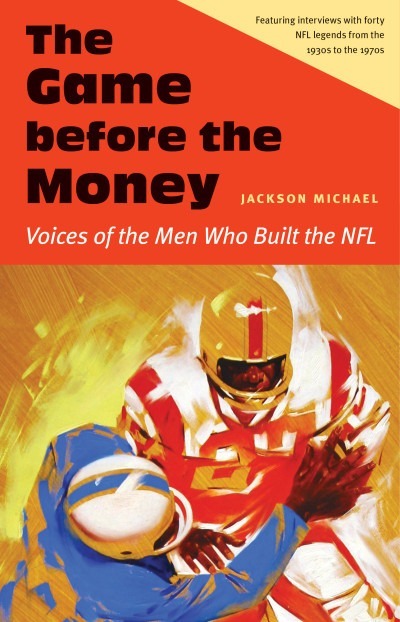 Thus began The Game before the Money: Voices of the Men Who Built the NFL. I prioritized writing the book over my music career, and lost a primary income source. I started working full-time in a mailroom to cover my cost of living expenses. I drove to Walt Garrison’s ranch and recorded a two-hour interview. He then gave me a tour of his home and memorabilia. Words can’t describe how incredible that day was. During the nearly five-hour drive home, I realized that I’d get to repeat the experience with Elvin Bethea a few days later. The only player I met before this undertaking was Dan Reeves, after a Broncos/Packers game my dad took me to for my 17th birthday. A few players put me in touch with their friends, as Walt Garrison did with Dan Reeves. My friends put me in touch with ex-players they knew. I also travelled to a few autograph shows. Many players’ agents were gracious in allowing me to ask for interviews, and most players were happy to do so. Only a handful of players rejected the idea. Other interviews were conducted over the phone after combing the White Pages of players’ hometowns, occasionally getting lucky. Remarkably, nearly everyone seemed to appreciate my calling and showing interest in their lives and careers. I spent countless hours transcribing, editing, and researching. Transcribing the interviews required the tedious playing and re-playing of miniscule segments. An hour of work produced roughly 10-15 minutes worth of interview transcription. Editing the material into organized, clear chapters took an incalculable amount of time. Roughly 2-3 hours of preparatory research went into each interview, and story facts were double and triple-checked afterward. The full-time job, while necessary to pay bills, posed a huge obstacle. Every second of downtime was utilized to edit, transcribe, and draft questions. Often I’d sit down, edit for two minutes, and be interrupted. Still, I was two minutes closer to completing the book. Thirty of those two-minute intervals are the equivalent to one hour. While perhaps not as effective as an uninterrupted hour, it proved better than spending those two minutes wishing for an hour. At home, I’d spend the majority of waking hours doing something associated with the project. The work consumed me for nearly three years. Sometimes God answers dreams in superlative fashion. I merely yearned for someone – anyone – to preserve the stories of NFL pioneers the way Lawrence Ritter, the author of The Glory of Their Times, had for early 20th century baseball players. I ended up the lucky fan on the field after the game ended, chatting with some of history’s most legendary players. Best of all, I learned as much about life as I did about football. Many of these men were part of the “Greatest Generation,” and their stories reflected those values. Not only did I enjoy the thrill of interacting with these icons, I became a better person afterward. NOTE: This post also appears on the University of Nebraska Press blog.